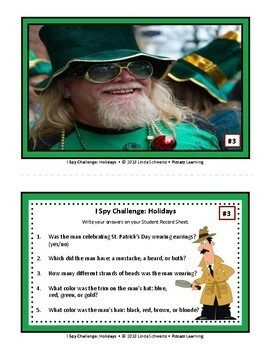 I SPY CHALLENGE: HOLIDAYS • St. Patrick's Day Fun! How can you help your students become more observant and aware – important skills that cross all areas of the curriculum? I Spy Challenge: Holidays was designed to help you do just that! 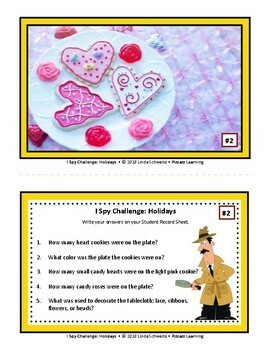 In I Spy Challenge: Holidays, students become junior detectives and study holiday photographs for three minutes taking in all the details they can such as number and color of objects, locations, signs, etc. • Then they turn the photo face down and get a question Task Card to see how well they observed recalled details from the photo. • Students record their responses on a Student Record Sheet. • An Answer Key is provided for each set of questions for self checking. Please note: The photographs must be reproduced in color since some of the questions refer to specific colors. Do your students crave more? There are six other sets in this popular I Spy Challenge series –all with different photographs and question Task Cards. Check them out in Pizzazz Learning! Thank you for visiting! As always, I welcome your comments and feedback! 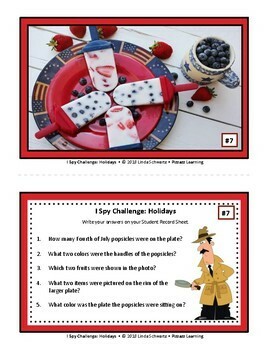 If you purchase I Spy Challenge: Holidays, please take a minute to rate it to receive TpT credits. Be FIRST, to learn about NEW products and SALE notices. Click the star in my store to become a FOLLOWER.